Do not say you're uncomfortable in your air conditioned office job. 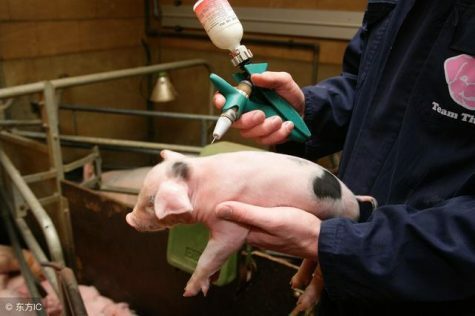 One piglet after another handed to me, my hand calloused and sore from the constant motion of the vaccination gun and lungs burning from the ammonia in the air. The one on my mind is to get the next 560 piglets done as fast as possible to start the next task of the day. Everyone should work in animal production or agriculture in their life. A normal day at a sow production farm starts at 5:50 am, shower in for the biosecurity, make the plan for the day with the rest of the team, and get all the work done before 5pm. It’s common for days to go over 13 hours but that’s working in agriculture. A farrowing monitor means overseeing 3-4 farrowing rooms each with 100 sows and approximately 1300 piglets. In the morning all the chores are done (feeding, fixing everything of place, making sure all the sows are healthy, and checking water lines). Chores take 4 hours and that’s if everything runs smoothly. In the afternoon piglets are born and the processing needs to get done. Processing means giving each 5 day old piglet 3 vaccinations and clipping the tail. Every day there are 270-1000 to process depending on the farrowing rates and can take 4-8 hours to get done. After working the entire day, constantly moving and tense, you go home and take care of your own animals or whatever else needs to get done. Do not say your tired after standing behind a cash register for 4 hours, going home and sitting on your phone. On the days when it’s 90 degrees it’s hard to breath and your lungs burn from the ammonia, feed dust, and animal dander in the air. The rooms are small and heat into the hundreds. After processing for the day you’re drenched and some days go through several sets of clothes. Nobody complains though. 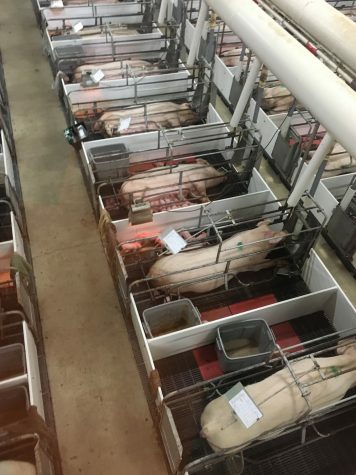 There’s a job that has to get done job to get done and several thousand sows relying on the team to keep them healthy and fed and thousands of consumers relying on the company to produce good pork later on. One small mistake loses the company millions. Do not say you’re uncomfortable in your air-conditioned office job. Working in animal production/agriculture is not thought of as very important. AGcareers.com states that most people aren’t willing to do the intense work that comes with a animal production job, or they don’t even know they exist. In 2050 how will 9 billion people eat if we don’t have people that want to do the hard work or who simply don’t know about it. People don’t realize the benefits of working in industry either. FWI.co.UK says working in agriculture makes a extreme positive impact and just having the experience allows more jobs everywhere else to open up for you. It Provides skills you can’t get anywhere else such as working large machines, working with large animals, or figuring out how to solve issues like broken augers. If more people knew where everything came from I feel there would be a larger appreciation that’s lacking for agriculture or animal production. Of course meat animals come from a farm but how many people actually understand where it all started. Pigs for example are first born at farrowing barns with thousands of others everyday. The piglets spend 30 days with their mother then are brought a nursery to learn how to eat out of the industry feeders and waterers. After that they are brought to a finisher barn for several months, then the slaughter house, But don’t forget the hundreds of people behind the scenes feeding, caring for, and treating each and every animal. The truck drivers and transportation needed for thousands of animals in between barns every day and the feed companies making the feed and supplying it for the animals. The world needs more people working in agriculture. The world needs more people with stronger work ethic.